The current term that is recommended to describe this cohort of patients is ‘tendinopathy’. Cook and Purdum proposed a new strategy when approaching tendon pain, and this is called the tendon continuum. The continuum model proposed a model for staging tendinopathy based on the changes and distribution of disorganisation within the tendon. The 3 stages are: reactive tendinopathy, tendon disrepair and degenerative tendinopathy. It has been suggested that the tendon can move up and down this continuum and this can be achieved through adding or removing load to the tendon especially in the early stages of a tendinopathy. Achilles tendinopathy can be described as insertional or mid portion, the difference is in the localisation. The insertional form is situated at the level of transition between the Achilles tendon and the bone, the midportion form is located at the level of the tendon body. Surgical specimens show a range of degenerative changes of the affected tendon, such as in the tendon fibre structure and arrangement as well as an increase in glycosaminoglycans, which may explain the swelling of the tendon. The precise cause of tendonitis remains unclear. Even though tendonitis of the achilles tendon is often connected to sport activities, the ailment is also often found with people who do not practice sports. The biggest cause is the excessive overburdening of the tendon. A light degeneration of the achilles tendon can be latently present, but pain only appears when the tendon is overburdened. It is also noted that the ailment is usually not preceded by a trauma. The achilles tendon is the biggest and strongest tendon in the human body. The tendon has the capacity to resist large tensile forces. It stems from a distal confluence of the gastrocnemius and soleus muscle and inserts at the bottom of the calcaneus. The blood supply throughout the length of the tendon is poor, as shown by the small numbers of blood vessels per cross-sectional area, especially the region 4-6cm above the calcaneus. A poor vascularity may characterize a slow healing rate following trauma. A reactive tendon is the 1st stage on the tendon continuum and is a non-inflammatory proliferative response in the cell matrix. This is as a result of compressive or tensile overload. Straining the tendon during physical exercise has been seen as one of the biggest pathological stimulus and systematic overloading of the Achilles tendon above the physiological limit can cause a micro-trauma. Repetitive micro-traumas that are linked with a non-uniform tension between the gastrocnemius and soleus, cause frictional forces between the fibers and abnormal concentrations of the loading in the achilles tendon. This has consequences such as the inflammation of the tendon sheath, degeneration, or a combination of both. Without the minimum time for recovery, this can lead to a tendinopathy . Decreased arterial blood flow, local hypoxia, decreased metabolic activity, nutrition, and a persistent inflammatory response have been suggested as possible factors that could lead to chronic tendon overuse injuries and tendon degeneration. The most common and perhaps the most important malalignment is the one of the ankle caused by hyperpronation of the foot. Increased foot pronation has been proposed to be associated with Achilles tendinopathy. In acute trauma, the external factors dominate, while injuries caused by overuse generally have a multifactorial origin. The acute phase of Achilles tendinopathy is caused by acute overload, blunt trauma or acute muscle fatigue, and is characterized by an inflammatory reaction and edema formation. If the treatment of the acute phase fails or if they overlooked it, it can cause a fibrin and form adhesions off the tendon. The progression of the reactive tendinopathy to rendon dysrepair can occur if the tendon is not offloaded and allowed to regress back to the normal state. During this phase there is the continuation of increased protein production which has been shown to result in separation of the collagen and disorgansiation within the cell matrix. This is the attempt of tendon healing as with the 1st phase but with greater involvement and breakdown physiologically. Degenerative tendinopathy is the final stage on the continuum and it is suggested that at this stage there is a poor prognosis for the tendon and changes are now irreversible. Often, tendon degeneration is found in combination with peritendinous adhesions, but this does not mean that one condition causes the other one. In addition, recent research showed an older age, higher android fat mass ratio, and waist circumference > 83cm, in men are associated with a higher chance of having Achilles Tendinopathy. The presence of COL5A1 gene variant was also found to be a possible risk factor. This gene is normally responsible for the production of tendon protein, but patients with the condition were shown to have significantly different allele frequencies of the COL5A1 BstUI RFLP compared with normal subjects. Therefore, besides overuse and degeneration, Achilles Tendinopathy was proposed to have a strong metabolic influence due to poor anatomical vascularity, association with body fat and the genetic factor. Morning pain is a hallmark symptom because the achilles tendon must tolerate full range of movement including stretch immediately after getting up in the morning. Symptoms are typically localized to the tendon and the immediate surrounding area. With people who have a tendinopathy of the achilles tendon that has a sensitive zone, combined with intratendinous swelling, that moves along with the tendon and of which sensitivity increases or decreases when the tendon is put under pressure, there will be a high predictive value that in this situation there is a case of tendinosis. The affected side of the tendon shows a larger diameter, higher stiffness and lower strain in comparison to the non affected side. Sever's Disease - Irritation of the back of the calcaneus at the growth plate. Occurs in young children and adolescents, particularly around puberty and during growth spurts. As always a subjective assessment is important for providing clues related to mechaniasm of injury and history of the condition. Clinicians can use a subjective report of pain located 2 to 6 cm proximal to the Achilles tendon insertion that began gradually and pain with palpation to diagnose Achilles tendinopathy. Observation for muscle atrophy, swelling, asymmetry, joint effusions and erythema. Atrophy is an important clue to the duration of the tendinopathy and it is often present with chronic conditions. Swelling, asymmetry and erythema in pathologic tendons are often observed in the examination. Joint effusions are uncommon with tendinopathy and suggest the possibility of intra-articular pathology. Range of motion testing, strength and flexibility are often limited on the side of the tendinopathy. Palpation tends to elicit well-localized tenderness that is similar in quality and location to the pain experienced during activity Physical examinations of the Achilles tendon often reveal palpable nodules and thickening. Anatomic deformities such as forefoot, heel varus, excessive pes planus or foot pronation, should receive special attention. These anatomic deformities are often associated with this problem. Recently, it was suggested that clinicians should use the Victorian Institute of Sport Assessment-Achilles (VISA-A) to assess pain and stiffness, and either the Foot and Ankle Ability Measure (FAAM) or the Lower Extremity Functional Scale (LEFS) to assess activity and participation in patients with a diagnosis Achilles tendinopathy. typical time course for recovery from symptoms. The Achilles Tendinopathy Toolkit is an evidence based clinical decision making aid to assist clinicians in their management of achilles tendinopathy. Individuals presenting with achilles tendinopathy should have a full biomechanical assessment. The BC Physical Therapy Tendinopathy Task Force suggest there is a small amount of clinical evidence to support the use of orthotics in the acute stage and a moderate amount of clinical evidence to support the use of orthotics in the chronic stage. Clinically consider using orthotics, perhaps using taping first, in the acute stage; consider using orthotics in the chronic stage. Less burdening activities should be encouraged so that the burden on the tendon decreases however complete immobilisation should be avoided, since it can cause atrophy The BC Physical Therapy Tendinopathy Task Force suggests that there is a large amount of clinical evidence to support the use of exercise in the chronic stage but the precise parameters to ensure effectiveness are not clear. Eccentric exercise in particular is supported although some protocols use both concentric and eccentric exercise. One RCT showed heavy slow resistance training is equally as effective as eccentric training. There is no convincing evidence that the most effective exercise regimen. A recent systematic review concluded that there is little clinical and mechanistic evidence that supports the use of the eccentric component and compare that well-conducted studies of different load programs are largely lacking. New loading based exercise regimes such as isolated concentric exercise, heavy slow resistance training (HSR), and eccentric-concentric have more recently been proposed but lack solid scientific evidence for their effectiveness in achilles tendinopathy. Thorough management guidelines for achilles tendinopathy is covered in detail in the Achilles Tendinopathy Toolkit. In combination with approaches to optimise biomechanics and prescribe exercise therapy, adjunct therapies may be used. These forms of therapy usually cannot resolve or prevent injury, they are used more for symptom management. There is no clinical evidence but there is expert level consensus to support the use of joint mobilizations in the acute stage if assessment reveals joint restriction. There is a small amount of clinical evidence and more substantial expert level consensus to support the use of joint mobilizations in the chronic stage if assessment reveals joint restriction May consider using manual therapy after a comprehensive evaluation of the hip, knee, foot and ankle reveals joint dysfunction. In the ankle mobilisations can be used for dorsiflexion limitation of the talocrural joint and varus- or valgus limitation of the subtalar joint . The effectiveness of deep cross frictions is not scientifically proven and gives limited results There is a small amount of clinical evidence to support the use of soft tissue techniques, such as frictions, in the chronic stage. May consider a trial of soft tissue techniques, such as frictions, in the chronic stage. There is no clinical evidence to support the use of Ultrasound and Low Level Laser Therapy. There is a small amount of evidence to support the application of iontophoresis using dexamethasone in the acute stage but not in the chronic stage. The role of iontophoresis is still investigational. May consider, in the acute stage, a trial of iontophoresis, 0.4% dexamethasone (aqueous), 80 mA‐min; 6 sessions over 3 weeks. A program of concentric‐eccentric exercises should be continued in combination with iontophoresis, if exercise loading is tolerated. Antipronation taping is supported by expert opinion not clinical evidence. May consider using taping, possibly prior to orthotics in the acute stage. Clinicians should not use therapeutic elastic tape to reduce pain or improve functional performance in patients with Achilles tendinopathy. Clinicians may use rigid taping to decrease strain on the Achilles tendon and/or alter foot posture in patients with Achilles tendinopathy. There is expert opinion to support the use of night splints and braces in the acute stage and a moderate amount of evidence against the use of night splints and braces in the chronic stage. Consider a trial of night splints and braces in the acute stage but NOT using night splints and braces in the chronic stage in conjunction with exercise. Clinicians may use combined therapy of dry needling with injection under ultrasound guidance and eccentric exercise to decrease pain for individuals with symptoms greater than 3 months and increased tendon thickness. Corticosteroid injection (CSI) appears to have short‐term pain‐relieving effects but no effect or detrimental effects in the longer term. The short‐term effect of CSI has been shown in the Achilles tendon with improvement in walking and reduction in tendon diameter as measured by ultrasonography. Intratendinous injection is contraindicated because of the catabolic effects, although a recent study of CSI into intratendinous vessels in six tendons has shown promising results. Peritendinous injection has fewer effects on the tendon and could be a worthwhile adjunct to a considered management programme. CSI may be most beneficial when used to relieve pain while continuing to undertake exercise programmes. The role of the neovascularization in tendon pain has been further examined in a pilot study where a vascular sclerosant (Polidocanol-an aliphatic non‐ionised nitrogen‐free substance with a sclerosing and anaesthetic effect) was injected in the area with neovascularization anterior to the tendon. Short‐term (6 months) evaluation of this treatment showed that the clear majority were pain free after a mean of two treatments. The tendons that were pain free had no neovascularization either on the outside or the inside. A 2‐year follow‐up of these patients showed that the same eight patients remained pain free with no vessels in the tendon. Ultrasonographically, tendon thickness had decreased and the structure looked rather normal . Rehabilitation after a sclerosing injection consists in 1 - 3 days of rest; then tendon-loading activity increases gradually avoiding maximum loading. After 2 weeks tendon loading activity is allowed (jumping, fast runs, heaving strength training). This research suggests a clinical role for sclerosing therapy for those who fail to respond to eccentric exercise. ↑ Clain, Michael R., and Donald E. Baxter. "Achilles tendinitis." Foot and Ankle International 13.8 (1992): 482-487. ↑ Cook JL, Purdam CR. Is tendon pathology a continuum? A pathology model to explain the clinical presentation of load-induced tendinopathy. British journal of sports medicine. 2009 Jun 1;43(6):409-16. ↑ MIKA PAAVOLA, M. P. (2002). Current Concepts Review Achilles Tendinopathy . THE JOURNAL OF BONE AND JOINT SURGERY, INCORPORATED , 2062-2076. ↑ VAN DER, Arnt, and Liselot VAN DE WALLE. "HET EXCENTRISCH TRAINEN VAN DE KUITSPIEREN." ↑ Kiewiet, Nathan J., et al. "Gastrocnemius recession for chronic noninsertional Achilles tendinopathy." Foot and ankle international (2013): 1071100713477620. ↑ Ahmed, I. M., Lagopoulos, M., McConnell, P., Soames, R. W., & Sefton, G. K. (1998). Blood supply of the Achilles tendon. Journal of orthopaedic research, 16(5), 591-596. ↑ Carr, A. J., & Norris, S. H. (1989). 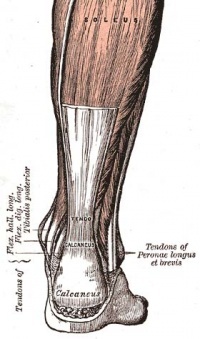 The blood supply of the calcaneal tendon. Bone & Joint Journal, 71(1), 100-101. ↑ Young, Jonathan S., and N. Maffuli. "Etiology and epidemiology of Achilles tendon problems." The Achilles Tendon (2007): 39-49. ↑ Paavola, M., Kannus, P., Järvinen, T. A., Khan, K., Józsa, L., and Järvinen, M. (2002). Achilles tendinopathy. J Bone Joint Surg Am, 84(11), 2062-2076. ↑ Gaida, J. E., Alfredson, H., Kiss, Z. S., Bass, S. L., & Cook, J. L. (2010). Asymptomatic Achilles tendon pathology is associated with a central fat distribution in men and a peripheral fat distribution in women: a cross sectional study of 298 individuals. BMC musculoskeletal disorders, 11(1), 41. ↑ Gaida, J. E., Ashe, M. C., Bass, S. L., & Cook, J. L. (2009). Is adiposity an under‐recognized risk factor for tendinopathy? A systematic review. Arthritis Care & Research, 61(6), 840-849. ↑ Mokone, G. G., Schwellnus, M. P., Noakes, T. D., & Collins, M. (2006). The COL5A1 gene and Achilles tendon pathology. Scandinavian journal of medicine & science in sports, 16(1), 19-26. ↑ September, A. V., Cook, J., Handley, C. J., van der Merwe, L., Schwellnus, M. P., & Collins, M. (2009). Variants within the COL5A1 gene are associated with Achilles tendinopathy in two populations. British journal of sports medicine, 43(5), 357-365. ↑ Abate, M., Schiavone, C., Salini, V., & Andia, I. (2013). Occurrence of tendon pathologies in metabolic disorders. Rheumatology, kes395. ↑ Ames, P. R. J., Longo, U. G., Denaro, V., & Maffulli, N. (2008). Achilles tendon problems: not just an orthopaedic issue. Disability and rehabilitation, 30(20-22), 1646-1650. ↑ 21.0 21.1 21.2 21.3 21.4 21.5 21.6 Achilles Pain, Stiffness, and Muscle Power Deficits: Midportion Achilles Tendinopathy Revision 2018: Using the Evidence to Guide Physical Therapist Practice. Journal of Orthopaedic & Sports Physical Therapy 48:5, 425-426. ↑ Fouré, Alexandre. "New Imaging Methods for Non-invasive Assessment of Mechanical, Structural, and Biochemical Properties of Human Achilles Tendon: A Mini Review." Frontiers in Physiology 7 (2016). ↑ Robinson JM, Cook JL, Purdam C et al. The VISA-A questionnaire: a valid and reliable index of the clinical severity of Achilles tendinopathy. British J of Sports Med. 2001;35:335-341. ↑ John J. Wilson, T. M. (2005). Common overuse tendon problems: A review and recommendations for treatment. University of Wisconsin Medical School, Madison, Wisconsin , 1-8. ↑ Rio, Ebonie, et al. "Tendon neuroplastic training: changing the way we think about tendon rehabilitation: a narrative review." British journal of sports medicine 50.4 (2016): 209-215. ↑ Roos EM, Engstrom M, Lagerquist A, Soderberg B. Clinical improvement after 6 weeks of eccentric exercise in patients with mid-portion Achilles tendinopathy - a randomized trial with 1-year follow-up. Scand J Med Sci Sports. 2004;14:286-295. ↑ 38.0 38.1 Malliaras P, Barton CJ, Reeves ND, Langberg H. Achilles and patellar tendinopathy loading programmes: a systematic review comparing clinical outcomes and identifying potential mechanisms for effectiveness. Sports Med. 2013;43(4):267-286. ↑ Beyer, Rikke, et al. "Heavy Slow Resistance Versus Eccentric Training as Treatment for Achilles Tendinopathy A Randomized Controlled Trial." The American journal of sports medicine (2015): 0363546515584760. ↑ Hammer, W. I. (1999). Functional Soft Tissue Examination and Treatment by Manual Methods. Aspen: Jones Bartlett Learning. ↑ James Henry Cyriax, P. J. (1993). Illustrated manual of orthopaedic medicine. Oxford: Elsevier Health Sciences. ↑ 47.0 47.1 47.2 47.3 47.4 Alfredson, Håkan, and Jill Cook. "A treatment algorithm for managing Achilles tendinopathy: new treatment options." British journal of sports medicine 41.4 (2007): 211-216.